Working out during pregnancy has always been a priority for me. While working out with a bump can come with its own challenges, perhaps the biggest challenge has been dressing the growing belly for working out. If you are like me at all, then your belly won’t be the only thing doing some growing. This means that for many of us wearing our old gear that we spent so much cash on won’t work for the entire 40 weeks. During my last pregnancy I didn’t do a ton of running after 27 weeks since I was so uncomfortable while running. I felt like baby boy was permanently parked on my bladder during every run and had lots of ligament discomfort. I mostly opted to keep my workouts to yoga, walking, using the elliptical machine and hiking as I entered my third trimester. Because I wasn’t running hardly at all in the third trimester I was able to get by with sizing up in a few items, but it was not enjoyable. This time around I’m still very much running and sizing up is quickly not working. If sizing up works for you then feel lucky. You will save so much money. Put the word maternity on a clothing item and the price increases dramatically. At Old Navy, for example, they recently had a shirt for the whole family deal. All shirts for baby, toddler, kid, teen, mom and dad were $5. The maternity style of the same shirt was $15. They’ve got us pregnant mommas trapped. We know we can stuff ourselves into a bigger size, but we likely won’t look good or feel good doing it. They know we will (likely) spend the money to buy the shirt in maternity. Trapped! When I feel uncomfortable with what I’m wearing or don’t like how I look in something I’m wearing, not only am I more likely to not do whatever it is that is making me wear this gear, but I’m much less likely to enjoy or want to do that activity again. If my shorts are constantly riding up or I look ridiculous on the run or my belly is hanging out, I’m much less likely to want to run again in general. This pregnancy I knew I needed to try something other than just size up in a shirt or shorts. Several people have asked me what I wear during pregnancy workouts, so I’ve decided to share with you all what has worked for me this pregnancy. Everything I’m sharing with you has been wear tested. I’ve run in it, walked in it, yogaed in it, barre classed in it, 21 day fixed in it. You get my point, and I’ve went into detail. If you don’t have time for that see my to the point comment under each link. If you are not pregnant, but might be someday and want to workout during, file this post away until you see that positive sign. I will be honest that some of my ideas involve spending some extra money, but in my experience with maternity active wear you pay for what you get. There just isn’t a way around this all the time. I have also been successful in finding a few ways to save money, too. Please keep in mind every pregnant body is different. While something might have worked for me, it may not for you. I do feel my recommendations will work for most women. Get ready for lots of selfie photos as I feel this is the best way to “show” how these pieces wear. You’ll also notice some things that don’t fit my life’s priorities right now like making my bed, putting away laundry in a timely fashion or washing mirrors. So what do I recommend in order of my favorites? You pay for what you get-cute, extremely flattering and excellent fit. You won’t regret your purchases and will find yourself wanting to wear these pieces all the time. During my last pregnancy I looked at this company’s website so many times. I was torn between the prices and if I was a dork to wear a shirt that said running for two. This time around I realized I don’t care if I’m a dork and there is a reason they can charge $45 for a tank top and stay in business. Their workout gear is a bit pricey, but is AMAZING! I bought a running for two tank to start off with using a 20% off coupon code I got for signing up for their emails in April. At this point I barely had a bump, but despite this it still fit comfortably. The material was so soft and didn’t ride up in an annoying way despite my nearly bumpless physique. They also make solid color tanks if the writing and feet are not your style. Now that I am 27 weeks I can say I love the tank equally if not more. It continues to fit comfortably (no tight stretching across the belly) and does not ever ride up. It is super soft and has held up with repeated washings. I also can’t believe how flattering the fit is. I’m confident this tank will still fit me during the remainder of my pregnancy. I was so confident in their fit and style that I bought another tank (in the same size-small) that says sweating for two and two different bottoms. The bottoms I purchased are meant to last through both summer and fall. 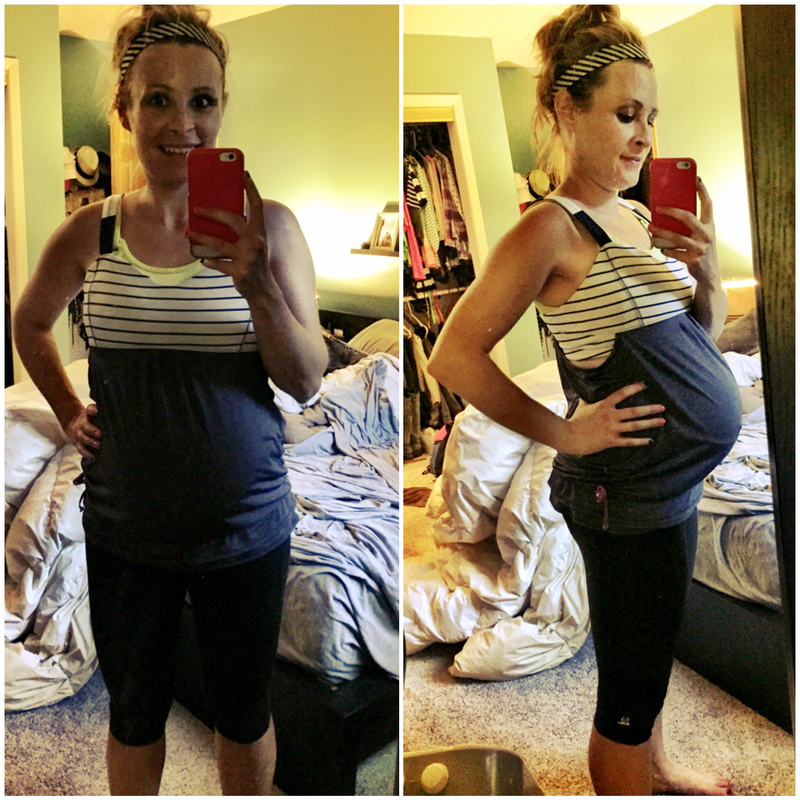 I purchased both the Inspiration Maternity Running Shorts and the Distance Maternity Capri. The Inspiration Maternity shorts are comfortable (they ride up occasionally when I wear my maternity belt and I don’t have it positioned right) and offer a full panel that can be folded under the belly, worn mid-belly or full panel. Despite the panel, it is soft and flattering and even seems to offer some support. The Distance Maternity Capri is super flattering, doesn’t ride up or move while working out and also offers a full panel that can be folded down as you like. I purchased both bottoms in a small. I think I may have been able to buy XS, but having an entire trimester left I feel buying the small was the right way to go. After wearing all of these items I can honestly say they are all super flattering, comfortable and bring nearly zero annoyance while working out. On a run the last thing I want to think about is what my workout clothes are doing. For Two Fitness is an example of you get what you pay for-quality, good fit and flattering. If you watch their facebook page and Instagram feeds you should be able to find coupon codes ranging from 20-30% off from time to time. New orders from customers can also receive 20% off their first purchase when you sign up for their emails. I never paid full price for my items. 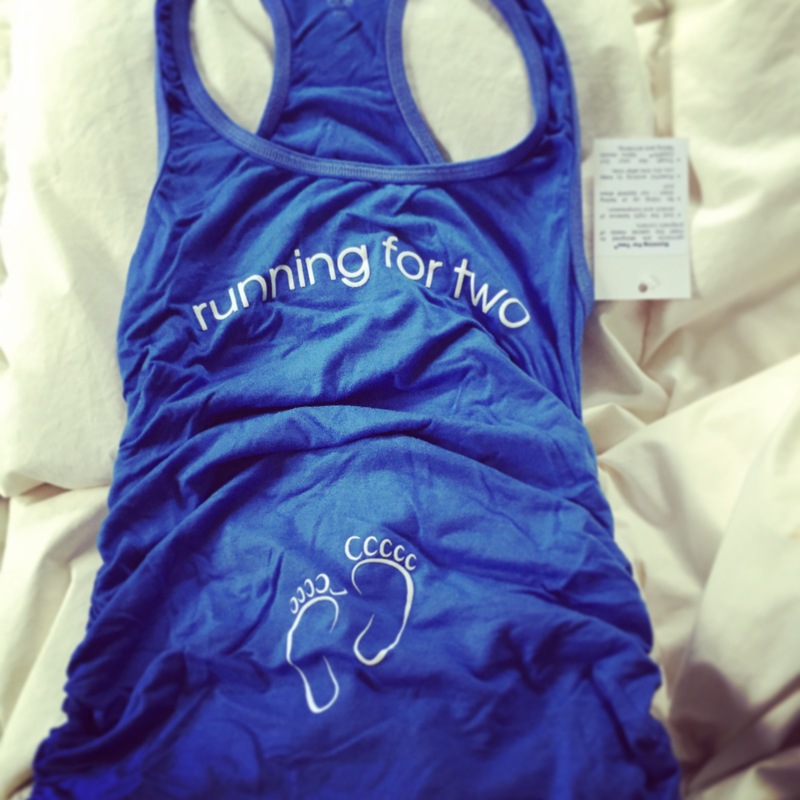 Such a cute and affordable way to dress the bump while working out…if you know your size. I know I said no to sizing up, but hear me out. 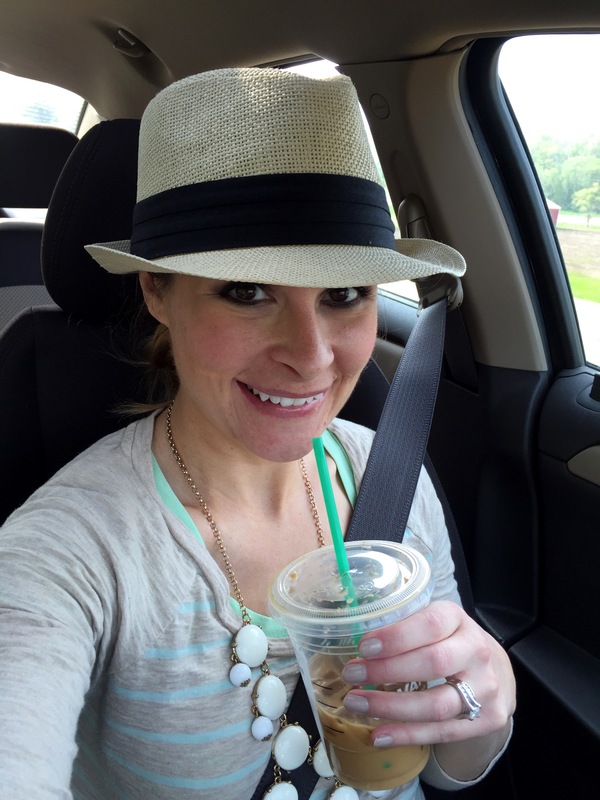 To balance out the more expensive purchases I made from For Two Fitness I took a chance that has really worked for me during this pregnancy. I have a few styles of Lululemon tanks that I just love and that are more flowy, yet flattering. These tanks have a sports bra top for extra support you’ll need as the ladies grow along with your belly and an elastic adjuster that can be tightened at the waist that I felt would really grow and flatter a pregnant bump without looking like I was working out in a small tent top. I figured if I went up a size or two these tanks would both allow for more room in the chest and the belly. Because I had no idea if this would work or not, I did not want to shop Lululemon’s-We Made Too Much section (not returnable) or spend full price on Lulu that might not fit. Then it dawned on me…Ebay. I had not used my Ebay account in some time, but I logged in and searched for a couple of styles that I knew I loved because I own them already and are there fit is flowy (specifically Back on Track Tank and Tame Me Tank), but flattering (sports bra and elastic adjuster at waist). Having two different sizes of the tanks already at home I knew that both tanks allow some flexibility in sizing, but decided to go up two sizes from the largest size I had to make sure these tanks would still fit me in the final days of my pregnancy. After doing a search on Ebay I found dozens of the tanks I was thinking would work available to bid on. I placed a few bids and won a couple of tank tops. With shipping I paid $21 and $27 for the tanks I won compared to paying $50 some from the clearance Lululemon section or $60+ for new. Since pregnancy lasts a short time I just could not justify buying brand new Lululemon that I hope to never need to wear long-term. Both the Tame Me and Back on Track Tanks (see For Two Fitness section for photo) will work awesome for hiding the postpartum belly, too. The best part is, my plan worked out perfectly. I love the fit and how flattering both tanks are. I might have been able to just go up one size, but I wanted to make sure these would fit comfortably in the final days of pregnancy and when the breasts are extremely large postpartum. If you’ve never shopped Lululemon before, then buying these tanks used might be a gamble when guessing your size, but I feel they run true to size normally. You might also consider looking up your favorite loose workout brand on eBay and buying up a size or two. I may or may not have a few more bids going right now for more Lululemon in a size or two bigger. Their workout gear is just so adorable and flattering that it is almost impossible not to love. Fun, comfy and cute tanks you will look forward to wearing during pregnancy and postpartum. Not likely to fit during the third trimester. I couldn’t find a full bump photo in one of their tops, but the above photos show me postpartum after my last pregnancy and how the fit changed as I got back to my pre-baby shape. I have loved, loved, loved Abundant Heart tanks since I learned about them from other bloggers and the fit ladies I follow on Instagram. Their tanks are not maternity, but the burnout tanks run a little big/long and are stretchy. This little bit big allows them to fit comfortably when you are not expecting and gives you the first two trimesters worth of expanding belly to still wear them. Postpartum these are so soft, the sayings motivating and the fit flattering. These tanks would be a great addition to your maternity workout wardrobe early on and something to look forward to wearing after baby, too. Make sure you select a burnout fit style if you are looking at wearing these during pregnancy or postpartum. The other styles are not as forgiving or as stretchy. This is another great company to follow on social media for coupon codes! I’ve never paid full price for their shirts. Add some fun to your pregnancy workout wardrobe. Great fit and flattering. Awesome for after baby, too. I love running skirts for the fit and cuteness factor. They are one of my favorite gear choices to run in AND they look great running errands or chasing a toddler. They made it on to my maternity running gear list because I feel they can be more flattering and forgiving than shorts to the growing pregnant body. Since they come with shorts underneath you have the coverage of shorts, but a skirt to smooth out your shape and it allows for hips and thighs to expand without the tight waist bands that can cut in and the restriction of leg holes. Most of my regular sized running skirts still fit at 27 weeks pregnant and a couple I went up a size in last summer when I was searching for running clothes to wear postpartum are working great during pregnancy, too. Most of my favorite skirts are from the Target C9 Champion line which makes them affordable, too. Two styles similar to the running skirts I own include the C9 Champion Women’s Skort and the C9 Champion Women’s Woven Skort. If you’ve not considered yourself a running skirt person, don’t count these out until you try them. You might surprise yourself. Inexpensive tops that you might have to try on in multiple sizes to get the fit and comfort you want. Be prepared for a few to work and a lot to not, but what you do find you have a good chance of loving. No, you did not read this wrong. Yes, Forever 21 is an often cheaply made teen store. I have not lost my mind. When you are looking for workout clothes that will last a short time, sometimes you look in unusual places. Last summer I was postpartum and trying to fit my ever-changing body with anything that looked flattering, was comfortable on the run and didn’t cause any wardrobe malfunctions. Oh, and the price couldn’t cut into my diaper budget. Somewhere, somehow I found Forever 21. I was quickly shocked at the quality and how their workout gear has held up over the past year. There workout clothes run small as they are a juniors store (mostly their bottoms which I’m not a huge fan of in general). When shopping here forget about the size and go with fit. 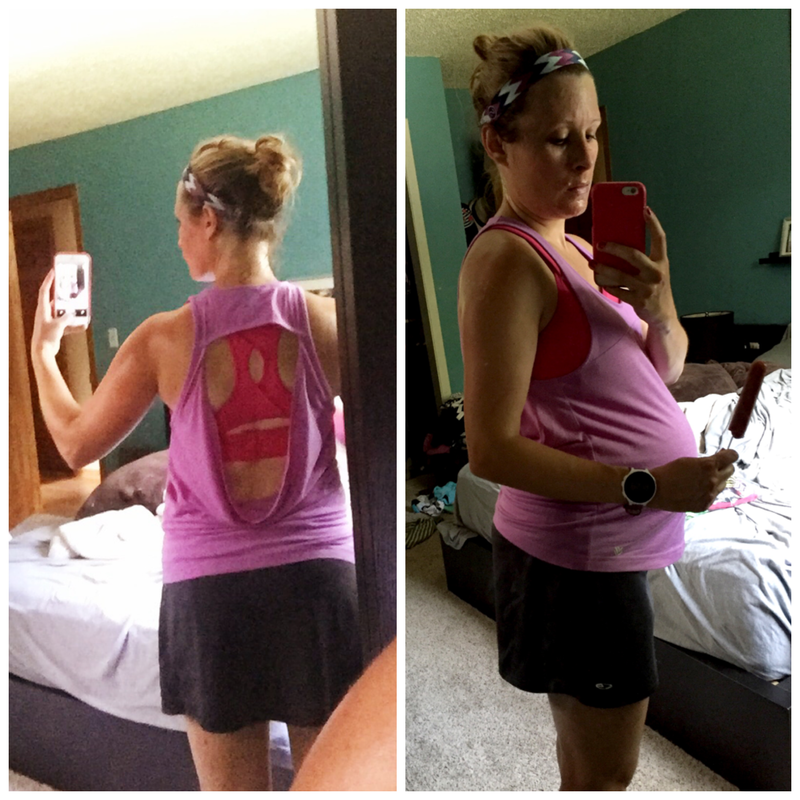 While some of their gear is hit or miss, I found some pieces last summer that worked great and are still in my running clothes rotation even as I’m about to enter my third trimester. I went with looser tank tops to hide the belly which has helped them work during pregnancy. Similar tanks include the Active 2-in-1 Space Dye Tank and the Active Shadow Stripe Muscle Tank (you might want to layer under this one). Because the clothing is so, so affordable you could even consider buying a style in more than one size if needed to last you your entire pregnancy. Appearances can be deceiving. What looks cute and comfy on may perform differently. An extremely affordable, but hit or miss brand of active wear. Some pieces you will love and others you will hate. I mentioned Old Navy for their maternity clothes in a post I did about my Summer Maternity Clothing Favorites earlier this month. My biggest issue with Old Navy is the fit is inconsistent. I did not like the fit of their maternity shorts, but the capris were ok. I believe some people may love them both though. One of the best features of their clothes is they are cute and affordable. The price on these is hard to ignore, but I’ve learned the hard way if it doesn’t really fit, then no deal is worth it because you will never feel comfortable or confident in what you are wearing. I also feel their active wear has the look of being active, but not the quality or wearability to hold up to intense exercise. If you are looking for cute athletic wear without actually working out much, it might be great for those comfy days or going for a walk. The shorts above are one of my favorites to wear around the house or running errands. 1) You will likely need postpartum workout clothes. After having baby number one I found that the clothing items I sized up in surely didn’t last me my entire pregnancy, but were the only things I found to fit in the early weeks after baby. Having something that fit got me out walking and running with some confidence when I would not have had the time or energy to shop for myself. I also put Old Navy as #5 because I did size up one size from my regular top and short size in their regular Active Wear collection and have found some success. The shorts tend to ride up, but the tanks are working ok for now. Both are cute which buys them some credit in my book. In another month I believe I will have phased out both the tops and bottoms, but again I know they will be used postpartum. 2) What kind of exercise you do determines what kind of gear you need. If you are not a runner and prefer walking or elliptical or lifting or hiking or 21 Day Fixing then this workout gear is likely perfect. You don’t have a need (as much) for items to not ride up or stay in place during workouts because your activity of choice will not move clothing around like running does. If you don’t need to spend the money on specific gear, then I would for sure recommend trying their Old Navy Maternity Activewear and/or sizing up in their women’s activewear. I currently save what I do have from Old Navy for short run days as it is not comfortable for my pregnant runs more than 3 miles. My shorts work great for a walk and ride up constantly on a run. #7-Sizing up in your favorite gear. Good luck! Some brands and styles this will work and others will not. Sometimes you will try this route to save money and it will be less than flattering, but nonetheless still an option. Sizing up in my first pregnancy. Can you tell it was winter?! Again, I don’t recommend this idea overall. I always want it to work, but as I mentioned already this is a temporary fix. During trimester two going up a size in my Nike Tempos and Old Navy Activewear helped me out this time around, but these are quickly losing their comfort and fit. I do have some lower rise shorts (Oiselle Distance Shorts and Lululemon Speed Shorts and Run Times) that I have been able to continue wearing in my prepregnancy size. I know this is likely temporary as my hips and thighs seem to expand and grow along with the bump. I don’t mind buying up a size in a few items I like because anything you size up in will probably be your go to gear in those first postpartum weeks and months so it is not a total waste. If sizing up stops working for you, then don’t be afraid to buy some real maternity workout gear. I’m so glad I did and really regret not doing so last time around. My suffering was not necessary. By mix and matching new and used along with maternity wear and sizing up you can find a comfortable, cute and affordable workout wardrobe to last you through all the pregnant miles, workouts and postpartum. Any maternity workout clothes you love? Let me know! I’m sure I missed some great brands and styles. Saturday I ran the Remembering Jesse Parker 5 Mile Race. Because of the races proximity to one of my favorite holidays, the Fourth of July, I just had to take the opportunity to dress in Merica related attire (Tank-For Two Fitness, Shorts-Oiselle, Socks-Procompression, Headband-Bic Bands). 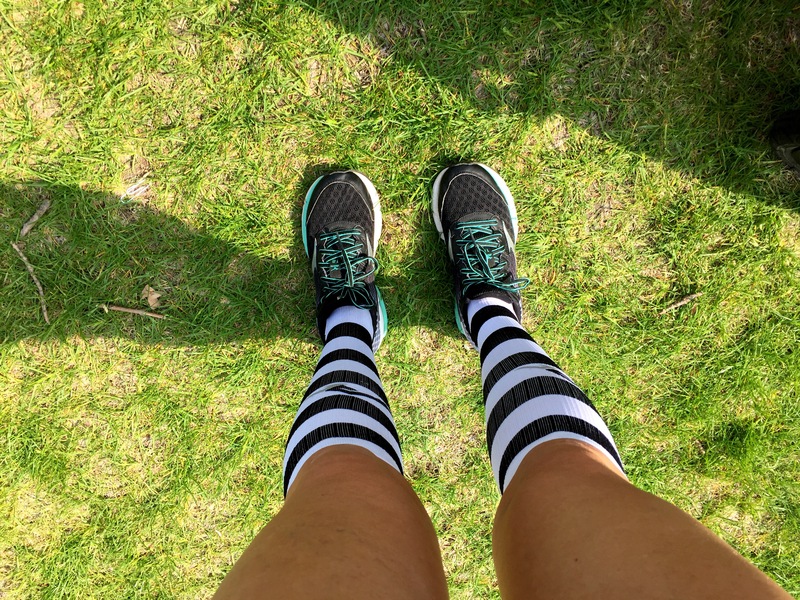 If you follow me on Instagram @sneaksandstilettos or on Facebook, then you know I did not wake up feeling like I wanted to run this race…at all. Running this race though was such a powerful reminder to myself that sometimes we don’t even know what is best for ourselves. I wanted to run the race, but didn’t feel like it that morning. Had I given in to those negative thoughts, I know I’d be regretting it now. Instead I got myself ready, out the door and to the start line despite not wanting to. Once that gun fired I was surprised by how good it felt to be out there amongst others running. The race atmosphere is so inspiring and uplifting. Seeing other runners go for it also makes me love running races. Everything just clicked Saturday morning, and I felt strong and great the entire race. I was able to maintain a slightly faster pace than what I likely would have running on my own. Just another benefit of racing! 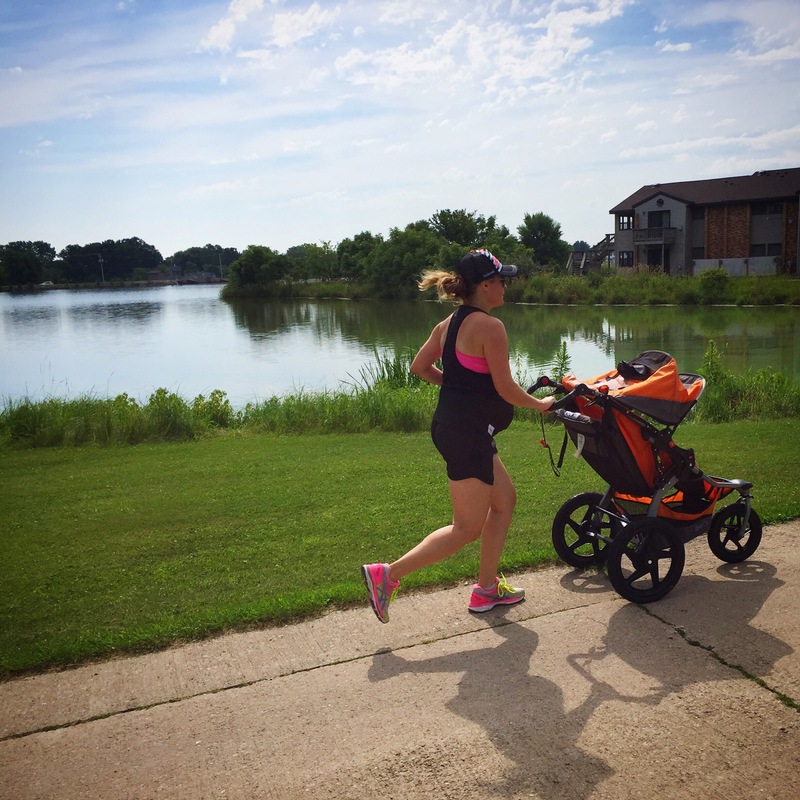 While running pregnant I never focus on my pace too much. Lately though I have been liking using my Garmin more than my Runkeeper app so I can keep a close eye on my pace. This helps me make sure I’m not going too hard when that uplifting song comes pumping through the headphones. Going too fast just makes the rest of the run harder these days, and I try to maintain a conversation pace a majority of the time when running. Saturday the miles felt easy and my pace reflected that. Despite one bathroom stop just before mile 3 being included in my time, I managed a 9:57 pace overall according to my Garmin. Some days I run this pace, some days a bit faster and other days slower for sure. 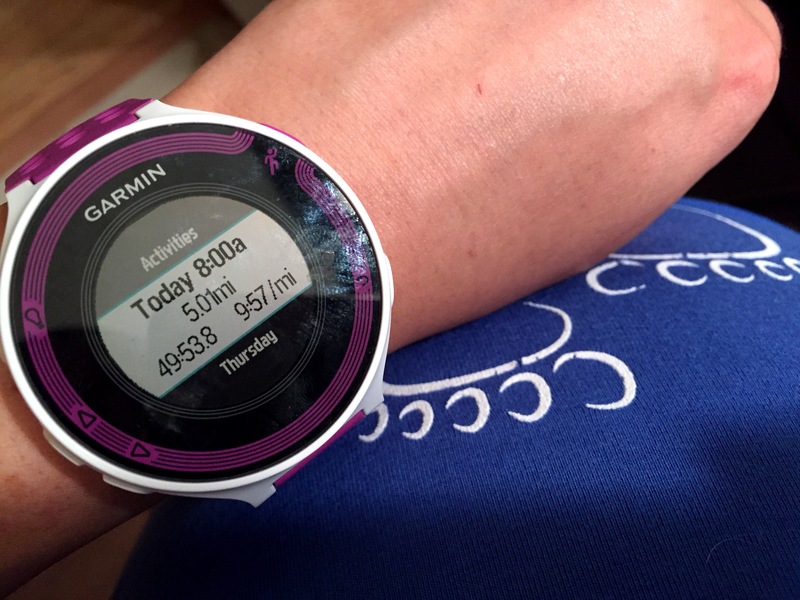 Each day is different when pregnant running. At 24 weeks pregnant I will definitely take it! Going by feel is the best advice I’d give to women looking to run while pregnant. Use the watch as a reference not an expectation and you’ll be much less disappointed or frustrated as your pregnancy progresses. I kept having to tell myself to not get caught up in the race and slow down. I had the whole race to go!! Racing (or running) pregnant is all about listening to your body, running appropriate paces and accepting that your performance will not be what it would be if you were not pregnant. Race times will slower, your place higher and your pace not what you are used to. So why race when pregnant? Racing is a great way to keep elements of the sport you love and can be incredibly motivating to keep running as the weeks creep towards 40! My mile splits are included below as this is a race report, but is only for my reference. Overall I’m feeling really good while running and am so excited that running 5 miles still feels great and fairly easy on most days. Again each day is different, but I was already getting very uncomfortable on most of my runs at this point in my first pregnancy. Here’s to hoping this feeling good continues. I’m attributing a lot of how I’m feeling to the consistency of my running with completing the Runner’s World Run Streak from Memorial Day to the Fourth of July. 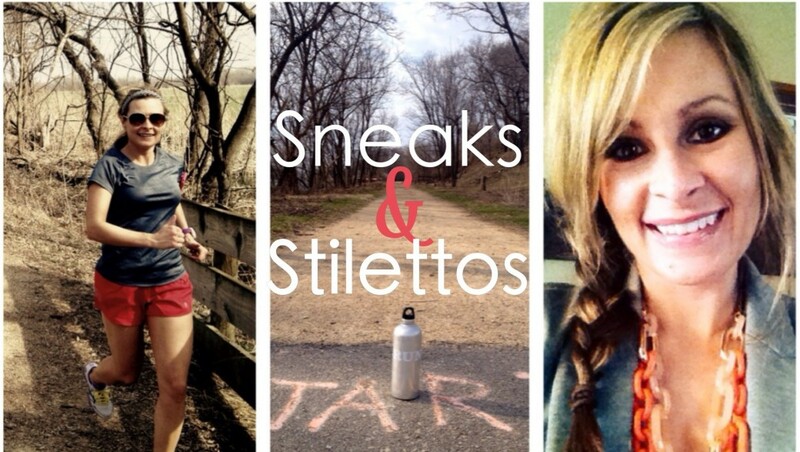 Stay tuned for a post on my #rwrunstreak this week! Here’s to more pregnant miles! I knew I really wanted to run a half a marathon before the pelvic pressure or discomforts of running became too much this pregnancy. 16 weeks pregnant seemed like a great time to complete a half marathon. Not exhausted in the first trimester and not uncomfortable yet. I also needed an excuse to wear the PRO Compression Jailbird socks I’ve been in love with forever and haven’t worn. Since I’ve been through this once before (pregnancy), it seems I’m having significantly less ligament pain and pressure on my pelvis than my first pregnancy. I’m so grateful for this and plan to take full advantage of this. Admittedly, my preparation for this race was not what it should have been. In fact I didn’t sign up until the night before since I had been sick with a nasty cold and pink eye for the past week and a half. The first trimester was not full of activity for me as I felt so tired and sick and struggled with time management, too. I hadn’t run a run over 6 miles in 6 weeks, but felt like my experience running 20 half marathons, 14 full marathons and one ultra marathon would help me through. 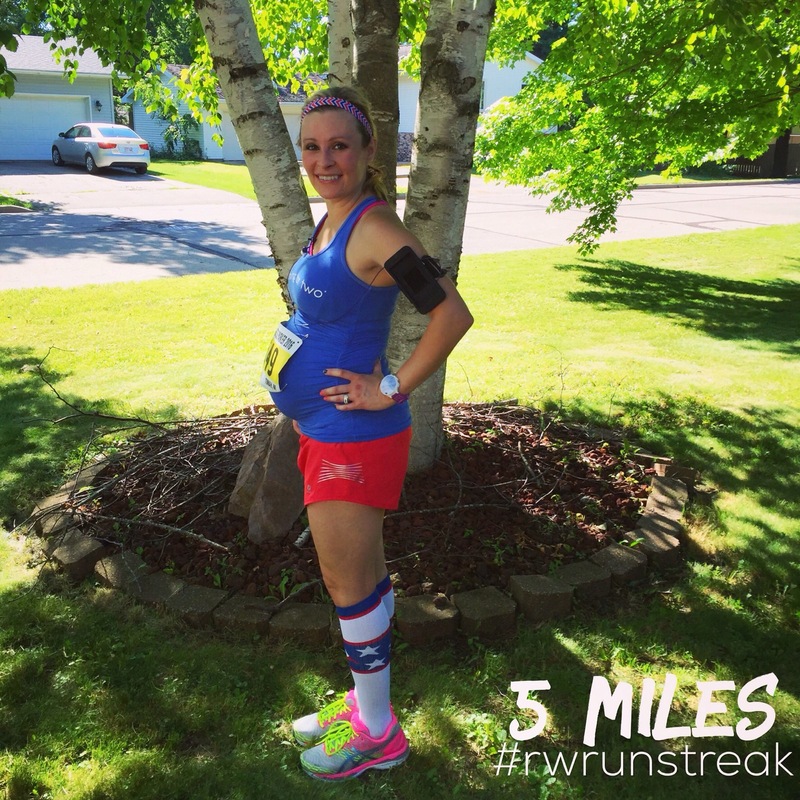 I had run a steady buildup of long runs until March running 13 miles at 7 weeks pregnant. 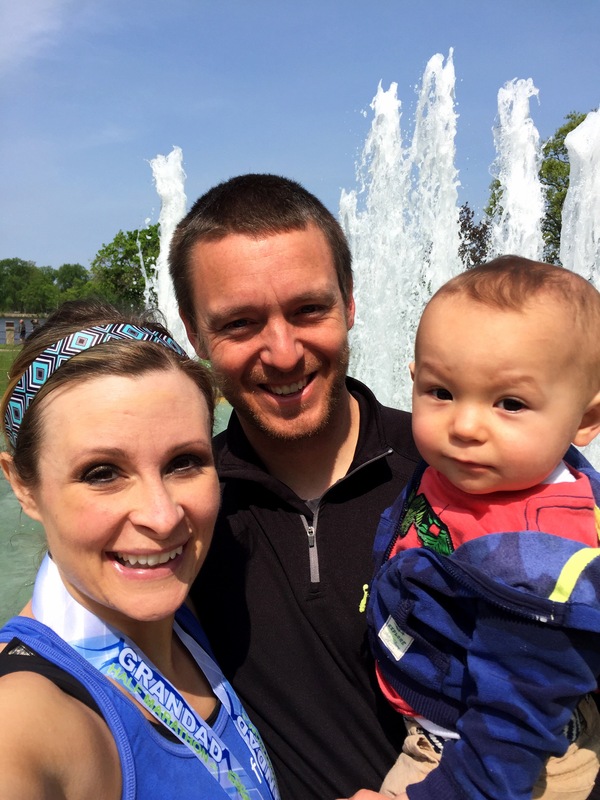 I did what you should do for any pregnant run during my race-listened to my body. I went much slower than my usual non-pregnant paces. I drank lots of fluids. I mapped out the restrooms before committing to the race. Bathrooms every two miles was a deal sealer for me. I could hydrate and relieve away! I said I had to be ok with needed walk breaks. Amazingly I only walked about a mile total during the half marathon. For me running this half marathon was something I needed to do for myself while also taking care of the baby inside me. I knew going in it would likely be my last half marathon for the next year. Having a baby in October in Wisconsin means you won’t see much for races until April or May. That would also put me at six months postpartum, which is just a few weeks later than when I ran my first half after having Pierce. Six months feels appropriate given you train or up mileage prior to the race and your need to heal and work that pelvic floor. 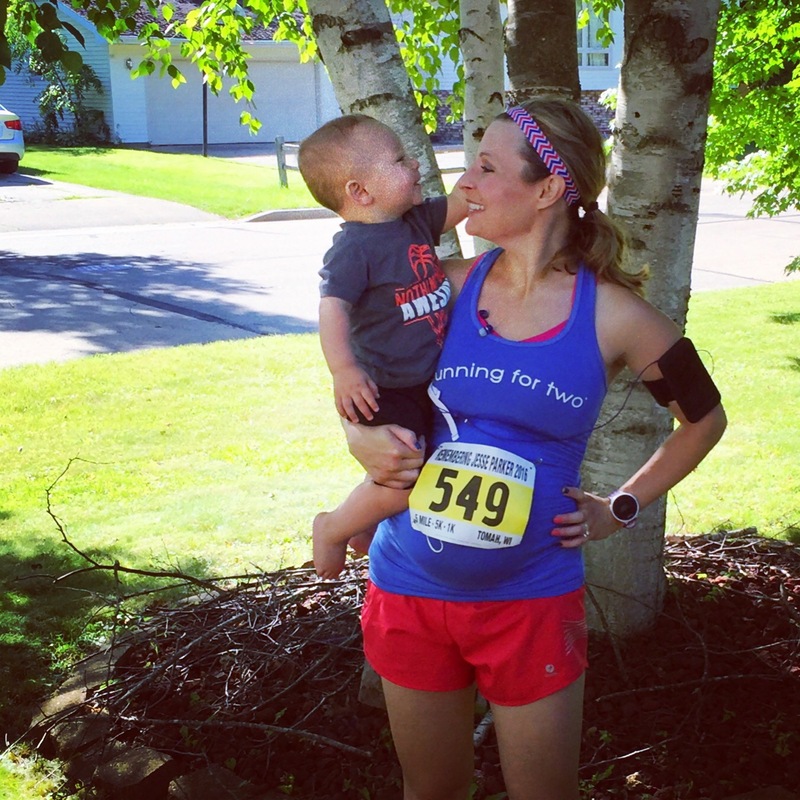 One of the hardest things about becoming a mom had been letting go of running. 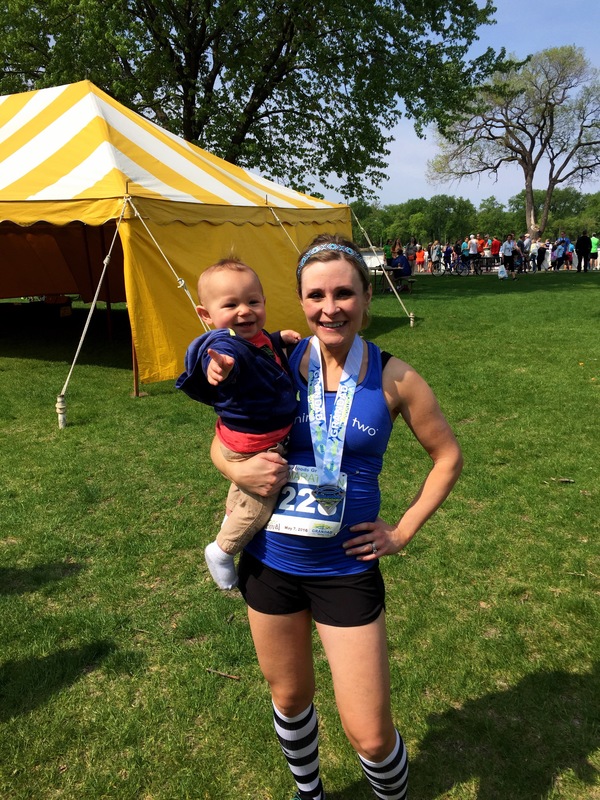 I needed to do one more race before having another baby, but I also wanted it to set the tone for the rest of my pregnancy. Last time winter and being trapped inside for workouts combined with so much pelvic discomfort meant much less activity than I had planned for during my pregnancy. This time I have spring, summer and early fall weather to help keep me going. I’m really hoping to have a very active pregnancy. Last time I was active, but not as much as I’d hoped. I feel the activity I did do helped me feel amazing post-delivery and helped me get back to activity much quicker. Back to the race recap! Miles 1 and 2 are run down Grandad’s Bluff. I personally don’t like downhill running a ton, so this wasn’t my favorite, but the views were great! These miles tick by fast! I of course drank a bottle of water with a Strawberry Lemonade Nuun on the bus ride (the best), and we waited forever to get off the bus so I only peed once before the race. We got off the bus at 8:00 which is when the race was supposed to start. It actually started at 8:10. As a result I made an early bathroom stop at mile 2, drank some water and was on my way. Mile 3 I struggled to set into a rhythm. Around mile 4 things clicked. My body felt warm and the rolling hills were almost over. Miles 5 and 6 I felt strong. I had a GU and water at mile 4. I could feel it giving me some extra energy. During these miles you run on a paved bike path with lots of blooming trees nearby. By mile 6 I had to pee again, but kind of forgot. I don’t know how this happened but it did. Mile 7 felt good, but by mile 8 I was thinking of a bathroom every step. I stared ahead in hopes of seeing that beautiful blue port o potty!! Otherwise I felt strong. I had another GU and water and Gatorade at mile 8 where I found a place to potty. I realized I was really sweating even though I felt great, so I decided here on out I would drink both water and Gatorade at every water stop. Miles 7-9 are my least favorite as they take you around a residential area in La Crosse. Residential areas are not all that motivating to me, but it was very flat. At the end of mile 8 my legs began to feel tired for the first time. I walked for a half mile and then felt good again. The rest of mile 9 and 10 felt pretty good. Mile 10 gets a bit more scenic as you run on a bike trail again. At Mile 11 I took a GU, drank some fluids and used the bathroom for what I hoped would be the final time. I struggled with this mile, but felt ok.
Mile 12 and 13 I felt good for what I was doing, but I could feel hunger and fatigue coming. I was glad to only have two miles to go. At least these miles are scenic as you run along the river and downtown. Pregnant running can take all the energy right out of your legs in a way that I’ve never really experienced when running otherwise. Luckily it only happened a few times, I’d walk a bit and then feel good. The quiet time to myself also gave me time to daydream about baby and life. Are you a boy or a girl? Just how crazy will life be with two kids 18 months and under? How great will the joy be to give Pierce a sibling? Will I still like my husband in a year? More importantly, will he still like me? As I crossed the finish line I was relieved to be done and wanted a snack stat! I ate a banana and a small cookie from the tent and then we enjoyed some time at Riverside Park. Then we headed to Fayze’s for brunch and walked around downtown while we waited for our turn to eat. I highly recommend Fayze’s for brunch, but be prepared to wait if something is going on downtown. 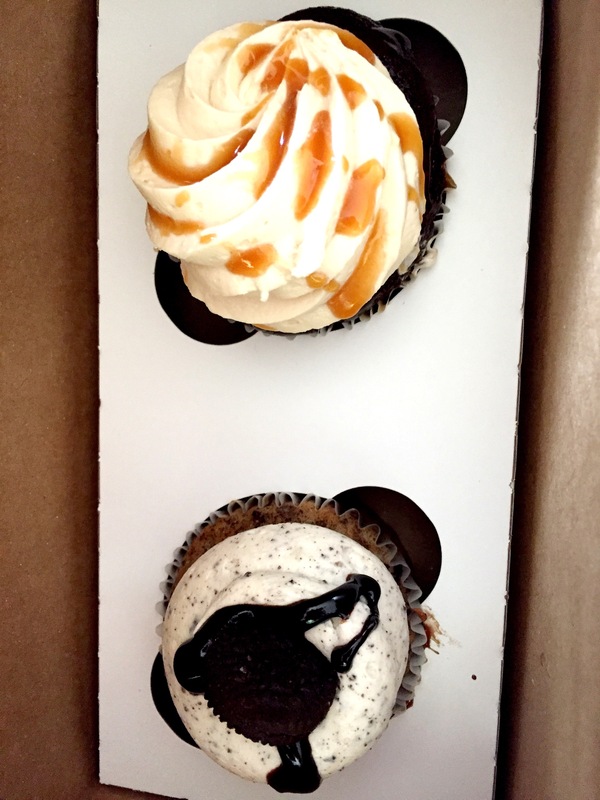 On our walk we stopped at Addie Cakes for some cupcakes to enjoy later in the day. It was the perfect way to celebrate a half marathon finish! Oh, and getting a caramel macchiato later at Starbucks really helped too. Dressing like your favorite drink is optional. 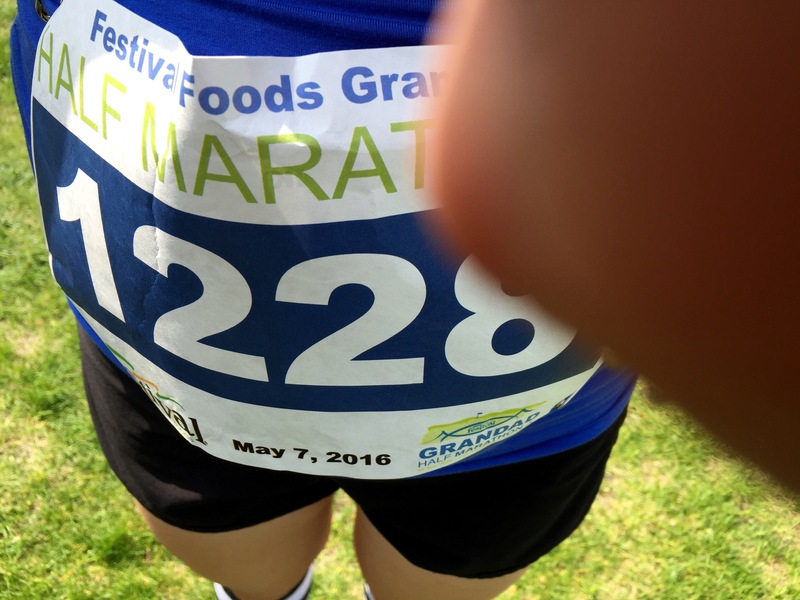 If you were looking for more race photos of the course, then you’ll have to check out my Grandad’s Half Marathon post from 2013. The course has not changed since I ran it three years ago. I felt I had enough juggling to do with my music, staying hydrated and fed and listening to my body, so I didn’t take any photos during this year’s race. Overall I really enjoy this course and it does have many scenic parts. I still debate whether it is a PR course or not. Prior to the change in course I did run a former PR. The downhill is hard on the quads unless you are prepared and might hurt you later in the race more than the time savings at mile 1 and 2. Definitely check it out for yourself. 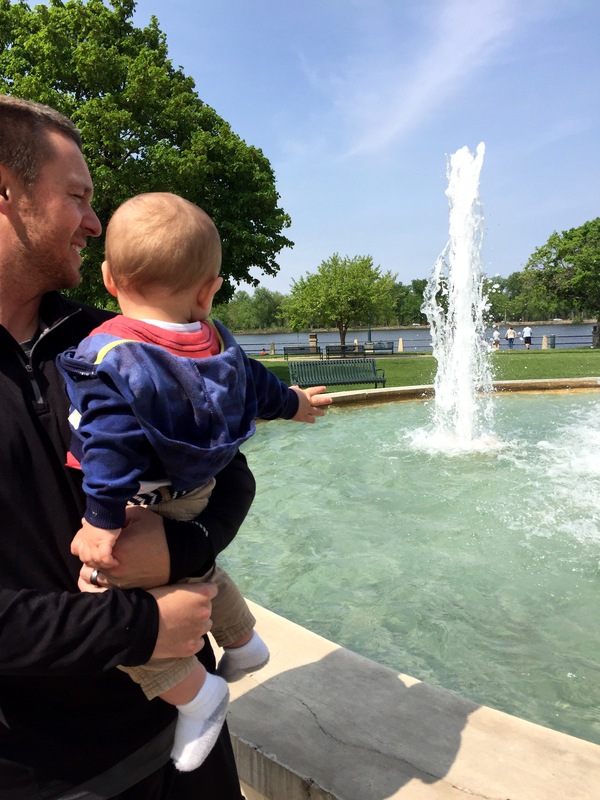 La Crosse is such a fun town with so much to do as a couple and/or a family. Family, good food, running and relaxing sounds like a perfect day to me!